Ever struggled to hear what is being played in your favourite song? Ever wondered what exactly is happening during that screaming guitar solo or big drum fill? Ever had to re-tune your instrument to practice one track that is tuned a semi-tone down? iRehearse is here to help! 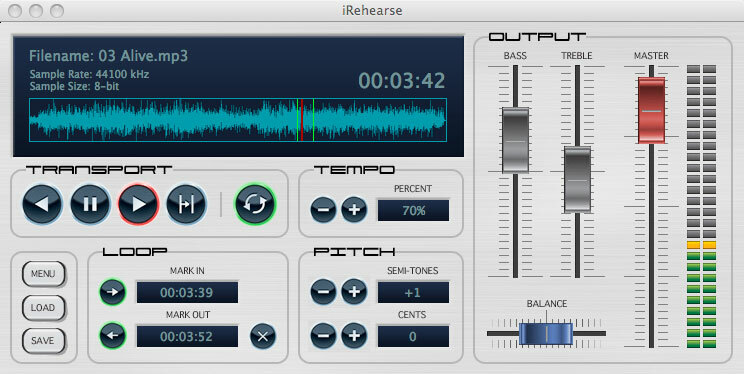 iRehearse is a software phrase trainer designed to help musicians learn, practice and transcribe tracks. Features looping, pitch shifting, tempo adjustment and audio EQ. ...... Slow down that hard to learn track to help you practice! The interface of iRehearse is designed to mimic a hardware device, making it a more familiar environment for a musician. So you won't need to be a computer genius to find your way around. Control the tempo (speed) of your track without adjusting the pitch. This means you can slow down a particular section of a song and hear each note more clearly. And as the pitch has not changed, you can still play along too! Ever tried to play along with 'Welcome to the Jungle'? You'll need to tune your guitar down one semi-tone. Alternatively, you could just tune the song up one semi-tone using iRehearse and play in normal tuning! iRehearse allows you to change tuning by semi-tone up and down two whole octaves (12 semi-tones = one octave). It also allows fine tuning using cents (100 cents = one semi-tone). Qweas is providing links to iRehearse 1.1 as a courtesy, and makes no representations regarding iRehearse or any other applications or any information related thereto. Any questions, complaints or claims regarding this application iRehearse 1.1 must be directed to the appropriate software vendor. You may click the publisher link of iRehearse on the top of this page to get more details about the vendor.